Chinese control of ports in other states – even those Beijing “owns” – will always remain limited. Earlier this month, Sri Lanka hosted a two-day conference among diplomats and non-government experts that rightly shone a spotlight on the increasing importance of the Indian Ocean. As highlighted by one delegation, it is currently what goes through the Indian Ocean (including half the world’s container traffic, one-third of bulk cargo transport, and around two thirds of the world’s maritime oil shipments) that particularly marks its global significance, rather than what may be produced from that ocean and its littoral states. The international trade associated with the Indian Ocean and the strategic significance of the region have become manifest. Yet for anything that passes through the Indian Ocean, it is almost inevitable that it must stop somewhere. Herein lies the importance of ports. China has recognized the critical role of ports, which its competitors have referred to as its “string of pearls,” as Beijing develops its Belt and Road Initiative (BRI). Chinese companies and state-owned enterprises have already entered into agreements with over 30 countries in relation to particular ports or assumed ownership rights over those ports. A striking example of the latter is the purchase of the Piraeus Container Terminal, which was already half-owned and managed by the Chinese state-owned shipping company COSCO. During one presentation at the conference, a delegate displayed a map of the region with national flags marking out the location of military bases and ports throughout the Indian Ocean area. The flags were to denote where one country was said to control a military base or port within another country. It was a stark checkerboard for an increasingly multipolar world. However, a military base is not the same as a port and while a port may obviously be used for naval vessels, the two should not be conflated. Sri Lanka was particularly at pains to explain that Hambantota is a commercial port. 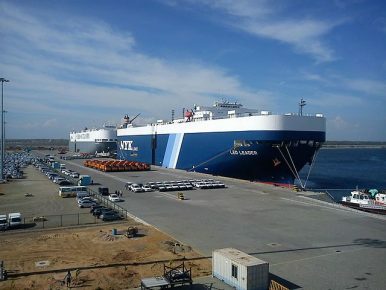 The Sri Lankan co-chair of the panel indicated that it made sense for Sri Lanka to have China’s investment in that port, given that the vast majority of commercial shipping coming into it was from China. Although suspicions abound that China wishes to use the port for other purposes, it is important to recall the international legal framework that regulates port access. As a matter of customary international law, ports are subject to the sovereignty of the coastal state. Under the UN Convention on the Law of the Sea (UNCLOS), even the outermost permanent harbor works that form an integral part of the harbor system are considered as part of the coast of the state and hence under its sovereignty. The International Court of Justice recognized in 1986 that a coastal state may regulate access to its ports because of that sovereignty. An earlier arbitral decision between Saudi Arabia and Aramco (the Arabian American Oil Company) proclaimed that “according to a great principle of public international law, the ports of every State must be open to foreign merchant vessels and can only be closed when the vital interests of the State so require.” While this sweeping statement is not widely accepted today, there is at least a presumption that ports will be open to foreign merchant vessels and that the coastal state has the power to decide when to close or restrict access. In the modern day, it is likely that closing a port arbitrarily to particular trade would be a violation of bilateral agreements or potentially the General Agreement on Tariffs and Trade under the framework of the World Trade Organization. Coastal states are entitled to place restrictions on entry into their ports, including setting conditions for entry. For example, UNCLOS anticipates that states will establish particular requirements for the prevention, reduction, and control of pollution of the marine environment as a condition for the entry of foreign vessels into ports. Once again, this authority is accorded to the state and not the port operator. States also exercise a number of different powers over vessels that enter their ports. Controls may be put in place to regulate the entry of unseaworthy vessels or other vessels that may pose an environmental risk to the coastal state. Under the 2002 International Ship and Port Facility Security Code, adopted under the auspices of the International Maritime Organization and its Safety of Life at Sea Convention, states are to take steps to ensure the security of ports. These steps include allowing states to put in place notice requirements regarding the entry of a vessel into port. States may also inspect fishing vessels in port that are suspected of illegal fishing, pursuant to the Port State Measures Agreement. The authority of the coastal state therefore extends to vessels that do not fly its flag in these circumstances. It is the regulatory power of that state that is most pertinent in these situations. There are circumstances where states may close their ports. We have the recent examples of Bahrain, Egypt, Saudi Arabia, and the UAE closing their ports to Qatari ships, as well as Italy and Malta closing their ports to vessels carrying people rescued at sea. Australia previously closed its ports to Japanese tuna vessels during a dispute with Japan over fishing quotas; Canada did so for vessels from Estonia and the Faroe Islands where there were concerns about illegal fishing practices. In each of these instances, it was the state making the decision to close their ports. It was not the operator of the port making those calls. Of course, the details of any deal struck for port construction matter. Yet irrespective of what the scale of foreign investment might be, we must always remember — for better or worse — that investment is always subject to the sovereign powers of the state in which that investment sits. Ports are no exception. Natalie Klein is a Professor of International Law at UNSW Sydney’s Faculty of Law, Australia and a Nonresident Fellow at the Lakshman Kadirgamar Institute, Sri Lanka. The opinions expressed in this article are the author’s own. They do not necessarily reflect the position of any other institution or individual with which the author is affiliated.